If I adore Our Lord Jesus Christ, what should be my response when the Mohametans come and take the Sepulcher of Christ? After this affront, can I go to a parish festival, content and grinning broadly, without taking into consideration the Sepulcher of Christ was taken? Is this reasonable? Does it make sense? No, it does not. Now, one single soul has much more worth than the Sepulcher of Christ. The soul of any one of us is worth incomparably more than the Sepulcher of Christ. Our Lord would never have become incarnate to save some inanimate object. He became incarnate to save souls because they are worth much more than any lifeless object. If I see a person who causes scandal, who leads another soul to sin and perdition, a person puffed up as a sinner, disdaining virtuous and upright men and, thus, offending Our Lord and I am indifferent to this offense; if I do not become indignant and disposed to fight, then I am nothing. If I know that the Church has enemies who conspire to extirpate her from the face of the earth, if I know that this conspiracy is continuous, constant, surrounding me completely like a sea encloses a fish; if I do not take the initiative to destroy this conspiracy; if I do not try to speak out forcefully to stop this cabal in its tracks and make it retract, then I am not truly a good Catholic. I am a bad Catholic, a piddling Catholic. I cannot say I have a true love of God. At the least, I should not offend God with my manifestations of empty, hollow love. I should speak frankly: "My God, have pity on me! You see everything: You see that I do not love You. I beat my breast. I do not love You. I am not going to lie to You. I do not have the love I should have for You. I lament this. Do not unleash Your anger on me. Pardon me and give me a serious love." What is true love of God? It is a combative love. That is to say, in relation to the anti-Catholic conspiracy, I should not desire that it just suffer some losses, but rather that it cease to exist and never appear again on the face of the earth. And if it should still exist, that it does so humiliated, fearful, contradicted in its goals, embarrassed and beaten. As much as possible in this great ideological combat, we should take the initiative in the fight. In defense of our rights, we should make aggressiveness the cutting edge of our dedication. It should be an aggressiveness in a legitimate defense of the Church, but a true aggressiveness. That is to say, in whatever is indispensable for her defense, we are ready to counter-attack, ready to sally forth at any moment, in all circumstances. But, we should not fool ourselves. This is not an easy position to take. We must train our minds by means of a continuous asceticism so that we may maintain such vigilance constantly, Because to combat is disagreeable, above all, when one combats seriously. To combat is not to attack on occasion when one is angry. Combat is the child of reflection and deliberation. Whether I am personally irritated or not should be of no account. I am a pure instrument in the hands of the Catholic Church, and I have to train my intelligence to show me when combat is in the interest of the Church. If it is in her interest to attack, I will attack, even if it is to my disadvantage. If it is in the interest of the Church that I remain silent, I will take as many slaps that come and allow myself to be stepped on in whatever way necessary, but I will be silent because it is in the Church's interest. For, if I love Our Lord and Our Lady as I should love them, I should live for the interest of the Catholic Church. This is the Crusader spirit. 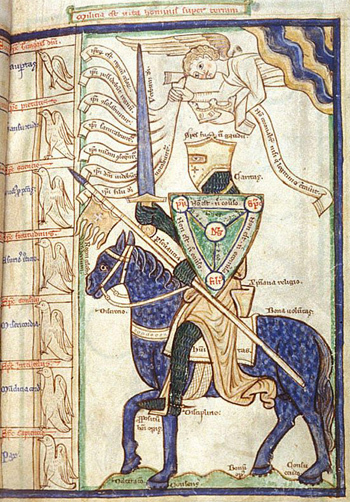 The Crusader is one who exercises over himself a continuous asceticism, so that he always makes a defense at the hour when he should, using all the force he should, always advancing or retreating as necessary, never holding back a blow to the adversary or never delivering a weaker blow than what should be given. This is the true warrior. To be like this, to seek not what people are thinking about you, but rather the position of militancy before the Catholic Church. This is the combative spirit, it is the warrior spirit. Each one of us must be a Crusader in every circumstance, a Crusader against all those who are against the Cross, fighting enduringly in all terrains, in all fields, in every way, from morning to night. We must fight with a smile or a scowl, fight with the word or the pen, fight in every available way. When someone views the true Crusader even from a distance, he says: "Here is a warrior. Here is the man who has a true Crusader spirit." 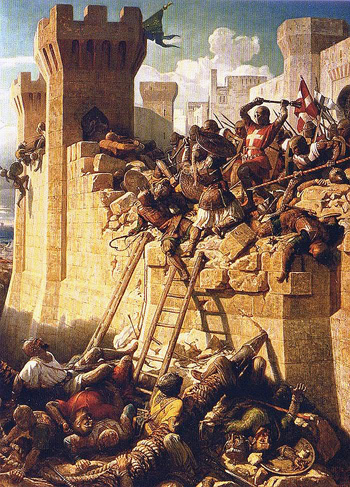 No, the Crusades Were Not Misunderstandings! A Counter Crusade - A New Notion of Infallibility?